Mother Nature's awesomeness can strike at any moment. She seems intent to remind us of this often. Have you noticed how many so-called 100-year weather events have occurred recently? From hurricane Juan in September 2003, to Katrina in August 2005, to the Boxing Day 2004 tsunami in Indonesia, to the Haiti earthquake in January 2010, to major Chilean earthquakes a month later, to many other record breaking earthquakes, tsunamis, volcano eruptions, hurricanes and cyclones around the world - over just the past decade. On Friday March 11, 2011, a devastating 9.0 earthquake hit western Japan. The magnitude ties the world's fourth all time strongest earthquakes and was Japan's strongest ever. Just as devastating was the tsunami that followed, also one of the world's all time worst, engulfing the hardest hit areas with waves of water topping 40 feet high to as high as 80 feet some estimate. Many aftershocks have followed, with many more expected. The USGS lists the Latest Earthquakes in the World - Past 7 days. Mostly near the east coast of Honshu, Japan had 14 earthquakes yesterday alone, measuring from 4.3 to 6.1. As of 11:00 AM EST today, Japan had 7 earthquakes measuring 5.0, 4.4, 6.0, 4.7, 5.3, 5.1 and 5.1… so far. Japan sits on three fault lines and is widely considered one of the world's most prepared. Many earthquakes and tsunamis have struck Japan before and will again. It would be an understatement to say this is not the ideal place to locate Nuclear Power Plants. However Japan is an island with little in the way of natural resources and relies heavily on energy imports. Nuclear Energy has enabled Japan to at least curb the many negative impacts of foreign energy dependency. Nuclear Energy was and still will be a large part of Japan's energy strategy - how to power the world's third largest economy. 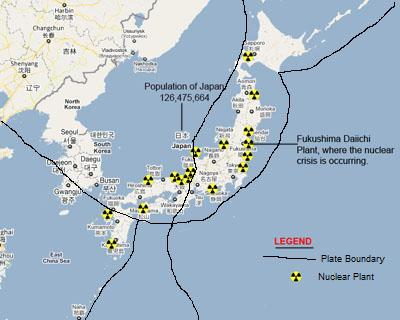 The nuclear crisis at the Fukushima Daiichi Plant has resulted in 14 of Japan's 55 reactors being shut. Radiation fears of food and water contamination are headline news everywhere. The world hopes for containment at the plant's 6 reactors to conclude quickly and safely. Unfortunately the full effects won't be known for years. Many countries depend on nuclear power, which accounts for approximately 15% of worldwide electricity generation. Every country with a nuclear reactor will inspect, stress test, advise and improve their emergency preparedness. China, Italy and others may place moratoriums on their nuclear programs for a while, but nuclear power is not going away. From a March 21 Xinhua News Report, "The 440 reactors that exist today will continue to deliver electricity at optimal levels. The 60-odd reactors under construction will be completed and those on schedule for construction start-ups particularly in the emerging nuclear economies, along with Russia and Korea will remain." Accidents happen! Less than a year ago we dreaded as the BP oil disaster in the Gulf of Mexico unfolded. Today, oil demand and oil prices are still climbing a wall of worry, nearing 2008 highs again. Critics will argue that was mainly birds and sea life, not people. An interesting March 13, 2011 blog article entitled "Deaths per TWH by energy source", shows that people killed per watt of nuclear energy is the lowest compared to Hydro, Wind, rooftop Solar, Peat, Biofuel/Biomass and Natural Gas. Oil and Coal deaths are way off the charts, with coal killing the most at 4,000 people for every one person killed by nuclear power generation, adjusted for the same amount of power produced. My point is that uranium stocks already sold off hard just before March 11, probably because they were one of the best performing stock groups over the prior 6-months and needed to correct. Then the Japan crisis happened and the price of uranium and uranium companies got slammed further - because of the damage to the Fukushima nuclear reactors. The question is how should uranium investors assess Japan's nuclear risk and the long-term impact on the industry. The short-term is still unfolding and will remain volatile, but is this a long-term opportunity? Are some of these stocks now likely oversold? So I searched for any examples I could find of injuries, hospitalization or death due to nuclear contamination or radiation so far. All I can find about cases of contamination or radiation is a March 22 list at World Nuclear News: "One Tepco worker working within the reactor building of Fukushima Daiichi unit 3 during "vent work" was taken to hospital after receiving radiation exposure exceeding 100 mSv, a level deemed acceptable in emergency situations by some national nuclear safety regulators. Another six Tepco workers have since received radiation doses in excess of the usual 100 mSv emergency allowance. One has received more than 150 mSv. Nine Tepco employees and eight subcontractors suffered facial exposure to low levels of radiation. They did not require hospital treatment. Two policemen were decontaminated. An unspecified number of firemen who were exposed to radiation are under investigation." Japan's National Police Agency has announced that 10,019 people are known to have died while 17,541 remain unaccounted for. A further 250,000 people are living in temporary facilities. This was almost entirely a result of the earthquake and tsunami, not the Fukushima nuclear power plants. Another snippet elsewhere, "All six of the crippled Fukushima nuclear reactors were reconnected to the national grid Tuesday. With the power lines connected, officials hope to start up the overheated plant's crucial cooling system that was knocked out during the March 11 tsunami and earthquake that devastated Japan's northeast coast." Worst-case meltdown scenarios at Fukushima likely have been averted but cannot be totally ruled out yet. 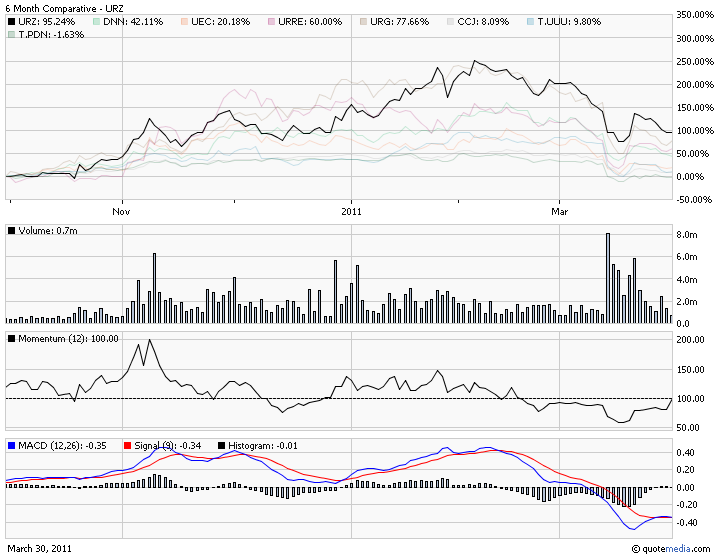 What has seen a meltdown of sorts has been the share prices of Uranium Miners, especially Small-Cap Uranium Stocks. One of the best performing groups over the past 6-months has recently seen declines of 28% to 34% from their February highs to the day before Japan's earthquake and tsunami. March 11 resulted in high volume panic selling, with the group now down 43% to 52% off their February highs - see table below. Those who missed the uranium bull market last year might now be asking if long-term uranium fundamentals have really changed that much? Is the recent sell-off an opportunity? The following chart show the best performing small-cap uranium stock over the past 6-months was Uranerz Energy (AMEX/TSX: URZ) +95.24%. This compares to Dennison Mines (AMEX: DNN) +42.11%, Uranium Energy (AMEX: UEC) +20.18%, Uranium Resources (NASDAQ: URRE) +60.00% and UR-Energy (AMEX: URG) +77.66%. Some of the mid-cap and large-cap uranium miners performed at: Cameco (NYSE: CCJ) +8.09%, Uranium One (TSX: UUU) +9.80% and Paladin Energy (TSX: PDN) -1.63%. Notice the declines in momentum and MACD before March 11, 2011, and then the huge panic selling spikes in volume after the Japan earthquake and tsunami. Uranium itself sold off from pre-quake levels of over $70 a pound U308 to under $50 a pound after the quake. The price of uranium has since recovered to over $60 a pound, but some of these uranium miners have yet to catch-up to where they were before at that level. Uranerz Energy has been one of our Featured Stocks since last December. Our February 16, 2011 newsletter is entitled "Imminent Final Permit To Commence Construction Of WY, USA Uranium Mine". This newsletter describes the company's current exploration and development activities at their 30 uranium projects in the Powder River Basin, Wyoming, and the potential short, near and long-term catalysts that have made URZ the best performing small-cap uranium stock over the past 6-months. My understanding is that the NRC is getting very close to issuing their final permit, to commence construction of the company’s first ISR uranium mine at their Nichols Ranch project.